Rotorsim, the joint venture owned equally by CAE (NYSE: CAE; TSX: CAE) and Finmeccanica - AgustaWestland, today announced that it has recently surpassed 100,000 hours of simulator training. Rotorsim was established in 2003 and officially welcomed its first class of students in June 2006. The joint venture of Finmeccanica - AgustaWestland and CAE was initially established to provide synthetic training solutions for the AW109 Power and AW139 helicopter operators with CAE-built Roll On/Roll Off (RORO) Level D full-flight simulators, and has expanded to include AW109 LUH, AW109N, AW189 and NH90 training. The Rotorsim training centre in Italy is located within the Finmeccanica - AgustaWestland 'A. Marchetti' Training Academy in Sesto Calende. Rotorsim also offers training on a CAE-built AW139 simulator located at CAE's North East Training Centre near New York City. Daniele Romiti, AgustaWestland CEO, commented, "This significant milestone for Rotorsim highlights our commitment to delivering high quality training services to our customers to enable them to enhance safety and mission effectiveness. We will continue our strategy to expand our training services in which Rotorsim is a key element." "Surpassing 100,000 hours of simulator training in less than eight years is a remarkable milestone for Rotorsim," said Gene Colabatistto, Group President, Defence & Security, CAE. "We are proud that simulator training has proven to be a safe, cost-efficient and effective learning environment for AgustaWestland helicopter operators, and expect that achieving the next 100,000 hours will take even less time as customers increasingly leverage the high-fidelity simulator training programs available at Rotorsim." Rotorsim's flight simulation capability, with an impressive 98% availability, currently includes five CAE Level D full-flight simulators in Sesto Calende with the most recent additions being the second AW139 and first AW189 simulators. The cockpits for AW109 Power, AW109 LUH, AW109N and first AW139 can also be transferred into an additional fixed-based Flight Training Device (FTD) docking station. The original AW139 FFS had recently been upgraded to include visual and scenario enhancements and the NH90 military FFS supports the training of pilots from four Nations. In the USA, the AW139 FFS had also been upgraded to deliver Phase 7 software capability as well as enhancements to the visual and scenarios and additional capacity is provided by an AW/Frasca FTD at FAA Level 6. Rotorsim will be continuing to expand and in 2015 will add the world's first-ever AW169 full-flight simulator to the Rotorsim training centre in Italy. The CAE 3000 Series AW169 simulator will be ready-for-training in summer 2015. A second CAE 3000 Series AW189 simulator, designed specifically to support training for search and rescue operations, will be ready-for-training in 2015. 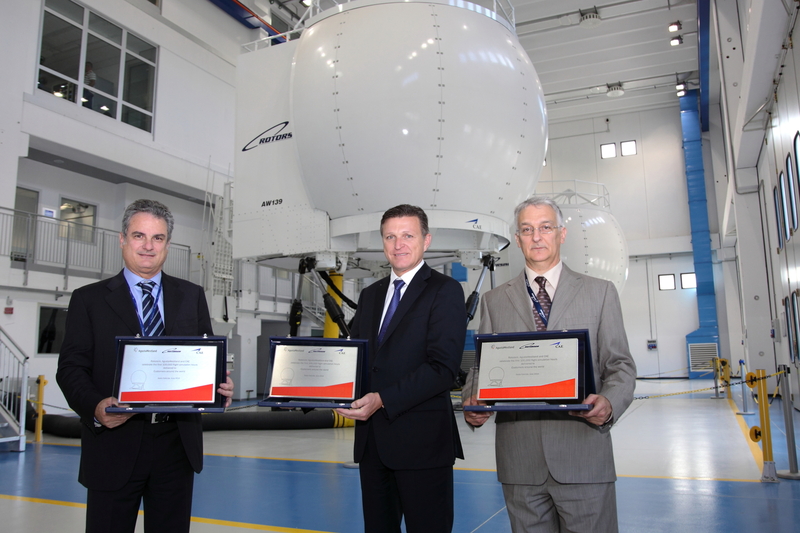 Caption: (Left to right): Daniele Romiti, AgustaWestland CEO; Marc Parent, President and CEO of CAE; and Stefano Ceriani, General Manager of Rotorsim, celebrate Rotorsim's milestone of surpassing 100,000 hours of simulator training.